Ford's 40 percent gain was its second-biggest this year. U.S. Car and Light-Truck Sales, Sept.
U.S. auto sales climbed 29 percent last month, the biggest gain of the year, as the industry resumed its recovery from last year's collapse. “It's a solid month, another step in a stable, somewhat painful recovery,” said analyst Jesse Toprak of TrueCar.com. Chrysler Group led the gainers with a 61 percent increase, while Ford Motor Co. posted a 40 percent gain. General Motors Co. sales rose 11 percent from September 2009 levels. Among Asian automakers, Toyota Motor increased 17 percent, American Honda advanced 26 percent, Nissan North America gained 34 percent and Hyundai-Kia jumped 44 percent. The increases followed a 21 percent drop in August sales, the only monthly decline this year. Just as last month's performance was aided by comparisons to a weak September 2009, August results suffered when framed against a clunker-fueled SAAR of 13.7 million units a year earlier. So far this year, industry sales are up 10 percent from 2009 levels. 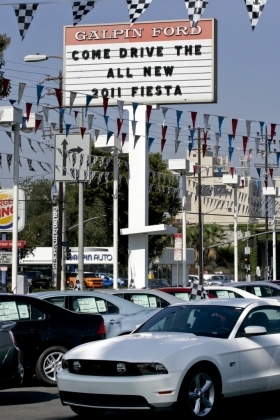 Last year was the weakest for U.S. auto sales since 1982. Ford's gain was the automaker's highest monthly percentage increase since February's 43 percent rise. Sales boss Ken Czubay said September would mark Ford's 23rd increase in U.S. market share in the past 24 months. GM's sales through nine months are now up 6 percent over year-earlier levels. It was the eighth monthly gain for GM this year, following a 25 percent August decline. Among GM's four surviving brands, GMC led the advance, with a 42 percent rise. The automaker said Buick rose 36 percent, Chevrolet was up 18.5 percent and Cadillac advanced 11 percent. The September gain helped GM transition from holdover 2010 models to new 2011 vehicles, said GM's U.S. sales boss Don Johnson. Chrysler sales increased to 100,077, enough to put it ahead of Honda for the industry's No. 4 sales spot last month. Deliveries of its namesake brand rose 92 percent, helped by the Town & Country minivan and Sebring sedan. The Dodge brand increased 71 percent, Jeep climbed 65 percent, and Ram gained 22 percent. The Thomson Reuters/University of Michigan final index of consumer sentiment fell to 68.2 last month from 68.9 in August. The drop was smaller than analysts estimated, evidence that the largest part of the economy may be stabilizing. Nissan North America sold 74,205 Nissan and Infiniti vehicles. Car deliveries expanded 34 percent, led by a 65 percent jump for Altima sedans. “This year has been a bit of a rollercoaster ride,” said Al Castignetti, vice president of U.S. sales. Sales should keep improving for the rest of 2010, particularly as light-truck demand remains strong, he said. Automakers decreased sales incentives and discounts by an average of 2 percent from last year, which may have kept sales from gaining more, according to TrueCar. Ford was the only U.S. automaker to raise incentive spending, TrueCar said. Ford's average discounts rose 7.4 percent from last year to $2,797 per vehicle, while Chrysler decreased incentive spending by 23 percent to $3,787 and GM cut incentives by 11 percent to $3,403. Honda's incentive spending rose 68 percent to an average of $2,166, according to TrueCar. Toyota boosted discounts by 38 percent to $1,870, and Nissan increased them 10 percent to $2,980. September had 25 selling days, the same as a year earlier. Jesse Snyder and Bloomberg contributed to this report.